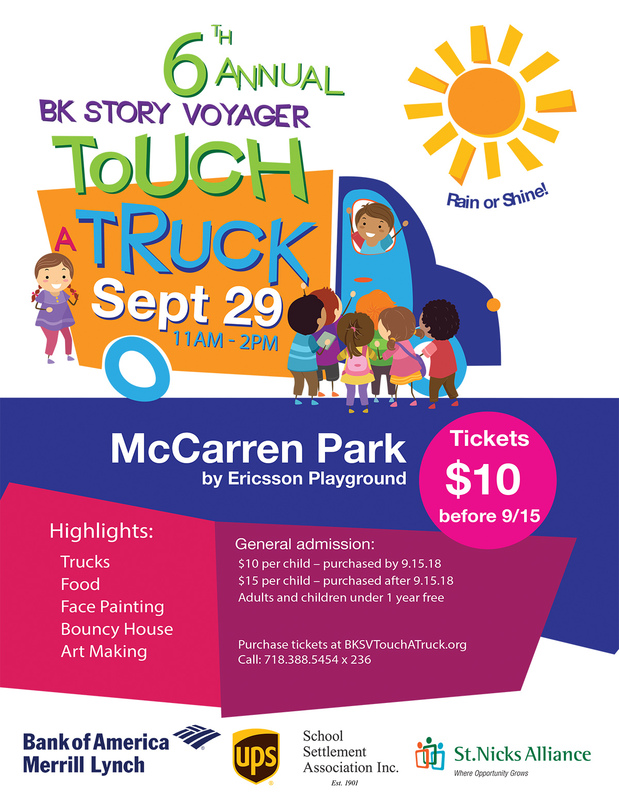 St. Nicks Alliance Corp - 6th Annual BK Story Voyager Touch a Truck! - Save $5 on Tickets has been extended until 9/28! 6th Annual BK Story Voyager Touch a Truck! - Save $5 on Tickets has been extended until 9/28! Join us on Saturday, September 29th to support the BK Story Voyager! The 6th annual BK Story Voyager Touch A Truck helps to raise operating funds for the BK Story Voyager (a mobile literacy inspiration and library), lovingly called "The Purple Bus" by our community school children. This purple bus promotes a passion for reading in children, especially those in underserved communities. St. Nicks Alliance created the idea for the BK Story Voyager as a vehicle (pardon the pun) to improve childhood literacy, a step which ensures subsequent opportunities. Research shows a direct correlation between the number of books children read and the future comprehensive success they enjoy as adults in terms of lifetime income and family self-sufficiency. Money raised will help purchase classic and contemporary children's books that engage young readers on a path to lifelong learning, in addition to other necessities to keep the bus on its route to local schools. Thank you to our incredible sponsors for their support! McCarren Park by Ericsson Playground.